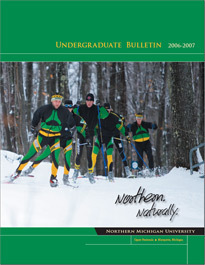 The 2006-07 NMU undergraduate bulletin is available in PDF format* as a single file or by individual section. Use the following link to download the complete 2006-2007 Undergraduate Bulletin. Individual sections of the bulletin are available below. Bulletins from previous years are availabe on the Registrar's Office Web site. * If you do not have software on your computer to read PDF files, you can download Adobe Reader for free.